From stunning Kings Canyon we drive on to Uluru, a mere 3-4 hours drive on high quality bitumen, so nothing to worry about for a change! We arrive just in time to witness one of the highlights of this part of Australia, commonly and quite aptly referred to as the Red Centre: the spectacular desert sunset at Uluru. Every day, when the sun sets behind the onlookers, it paints the great ancient monolith in all shades of red, from dark orange to blood red, until this stoney monument is dipped into deep shadows that will eventually be the final call of yet another day in the endless universe of things. The National Park of Uluru and neighbouring Kata Tjuta are in the hands of the local Aboriginal people and its management is well organised and efficient. Motels that mushroomed in the early days of tourism along the highway in close proximity to Uluru (or Ayers Rock as it was called back then) have all been demolished since the Anangu have taken over ownership and control of the lands. Instead, Yulara was planned and constructed, a purpose-built resort for the thousands of tourists that flock to Uluru every year. This resort includes facilities such as a petrol station, a domestic airport and a shopping centre. Yulara caters for all budgets and accommodation styles, from a camping ground to an exclusive 5-star hotel, so that every visitor will find just the right accommodation here, provided he is willing to accept the somewhat steeper prices that probably cannot be avoided in such a secluded an exclusive location. 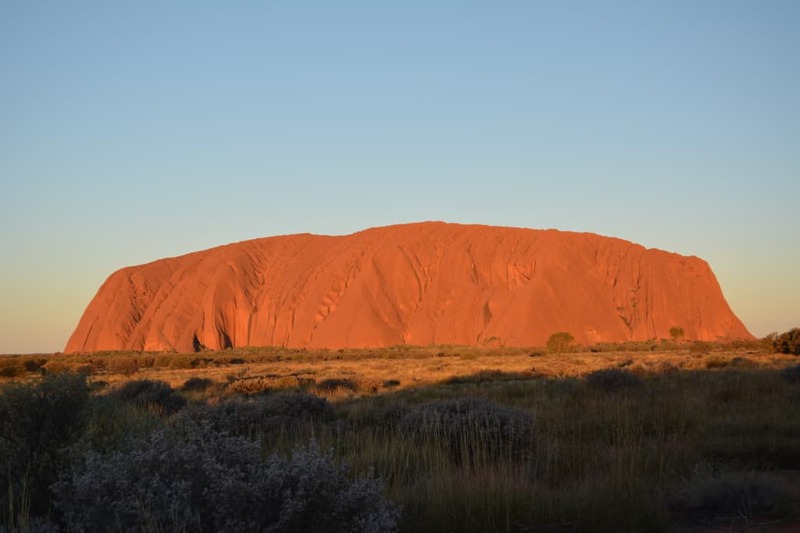 For a cheaper alternative, visitors will have to drive at least an hour to stay elsewhere, but then they will probably miss out on two of the top things to experience in Uluru: the sunrise and sunset. Since there really is no other alternative around for miles I urge you to make a booking before travelling, as we saw many campers at the end of the day that were not able to secure a powered site – if you are in the desert in winter this is not a fun experience and best avoided. Anyway, instead of driving directly to Yulara for the night we pressed on to enter the national park where we purchase a 3-day pass. We park at one of the designated sunset viewing spots with our motorhome. While our pasta bolognese is simmering on the stove we watch the magical change of colours on Uluru’s surface, and it is not difficult to see why the rock holds such significance to the local people. So sudden, so unexpected does it rise above the desert ground, standing tall and proud, that one can only feel two things in its proximity: awe and attraction. Around us, other visitors pull up to watch the spectacular transformation. While it is getting busy around us, it is not exactly crowded, the atmosphere almost solemn and appreciative. Uluru is a photographer’s dream come true, many of those around us set up tripods and take a picture every couple of minutes of two with avid precision that is a bit lost on us. Others unpack their camping chairs and enjoy a chilled evening beer. No pushing or shoving, just a unified sharing of this wonderful experience. While the sun sets behind us, the rock’s colours seem to light up in even brighter shades of red, from the yellowish daytime orange to a glowing fire, until it finally fades into the colour of dried blood. In the background, the sky puts in extra efforts to frame Uluru to maximum effect: when the rock finally turns black, the sky shimmers iridescent in all colours of the rainbow until settling on a blushing pink which eventually turns to black as well. You may think it crazy to travel thousands of miles just to see the play of colours on a rock’s surface, but let me assure you that this experience will be one of these things I will never forget. Uluru is so much more than a geological oddity or a jest of nature, it is a reminder of all the grand things that deserve to be written with a capital letter: Mortality, Eternity, Nature, Peace, Freedom, Destiny, Beauty. While you stand and stare at the stone in the middle of the desert you cannot help but reflect on at least one or two of these things. Yes, it might be a bit of a costly and time-consuming exercise to get here but if you truly want to see and understand the mystical side of Australia then Uluru needs to be featured on your itinerary.